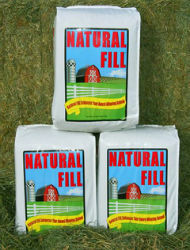 Natural Fill is a combination of Timothy Hay, Soybean Hulls, Steam-Flaked Barley, Oats, and Alfalfa. Palatability encourages intake. Improves feed efficiency while increasing fiber digestion. Replaces beet pulp as traditional fill. Natural Fill sets the standard for ultimate fill by increasing the dimension of the upper and lower body in a very natural smooth pattern. Every bag contains the same consistent combination of the highest quality products available. Natural Fill improves feed efficiency and helps fiber digestion, sustains hair growth, maintains the immune system, aids in feed consumption. This unique blend encourages hot, tired, and stressed animals to maintain feed intakes.